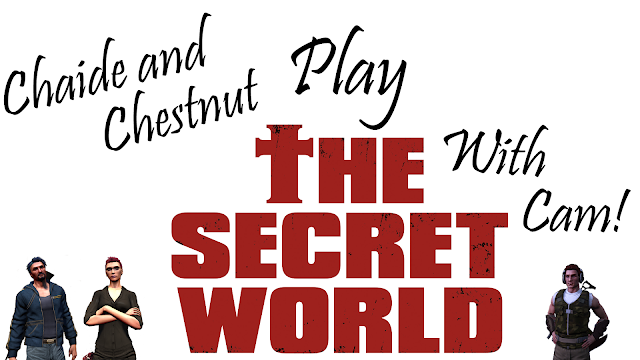 Back when I started playing The Secret World again, Chaide and I decided we should do it as a Let's Play, and we roped one of our friends in to play with us. Eventually we roped another friend or two to play with us, and I have this lovely back catalog of Let's Play videos to put together starring all of us. However, I haven't been able to bring myself to work on them. Mainly, it's due to the fact that Chaide is there in those videos. The other (smaller) reason, is that the back log is just massive. Tons of gigs of video to convert and put together. But even when I feel like putting the videos together, I open it up, listen to a moment of Chaide's voice, and close it down. I've been healing fairly well through this divorce process. Some days are a cakewalk, and others not so much. I'll get there eventually. But having these videos looming over my head isn't helping that process at all. I spent most of my New Year's Eve cleaning up the apartment and getting rid of anything that reminded me of him. A literal new beginning, as it were. But I never got rid of the digital reminders. And that's what those videos are. So I'm going to be getting rid of that massive back log of video content. Just tossing it. The videos I have on YouTube will stay up there. I'll probably make a follow-up video with footage of a new character explaining that series is coming to an end, and you can find a new series called... well, whatever I decide to call it. As a part of my healing process and moving on with my life, it doesn't behoove me to keep these videos around and to force myself to work on them. Instead, I'm thinking of staring up a new character (y'all voted for Dragon on Twitter) and, well, either streaming or recording myself going through the missions! I currently have two Templars, and while I love the Templars, and want to finish the story out (which I might do as a LP of just me soloing the later missions and content at some point), I need a change of scenery. The only complaint I have about this...? What about all my cool costumes and pets on my main?! Tilty, pls!